The Tonle Sap (The Great Lake) is the fl owing heart of Cambodia, giving love and life to millions of people. It has more fish than any other lake in the world and is home to an incredible variety of birds, including rare and endangered feathered life. Transfer to welcome lounge followed by welcome drink while your information is being processed for boarding then continue by road for short a distance to boat pier of Tonle Sap Great Lake. 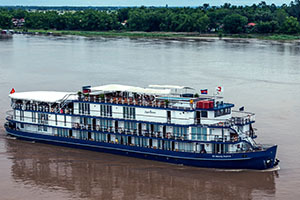 Resume by local boat to dock our luxury ship, check in and enjoy delicious lunch on board as the Mighty Mekong journey begins. Enjoy high tea in the afternoon, relax on your private balcony before dinner is served and a presentation about “Geography of the Mekong and Tonle Sap” will be provided by expert guide. You may like to watch classic movies at lounge cinema or enjoy yourself. Transfer to welcome lounge followed by welcome drink while your information is being processed for boarding then continue by road with 4.5 hours to Kampong Cham where our luxury ship sits, snacks are provided during the trip. Check in and enjoy buffet lunch in the dining hall. Afternoon, learn more about the education of the young Cambodian generation (NGO project). The children join us on board, always excited to show their skills in music and art. Afterward, disembark and continue by road to take interesting photos of the bamboo bridge across Mekong River from the city to Pan island and admired by Wat Hanchey – one of the Pre-Angkorain temples, built in 7th century, pampered by breathtaking views over the Mekong. Back to our ship for relaxation, dinner and overnight. 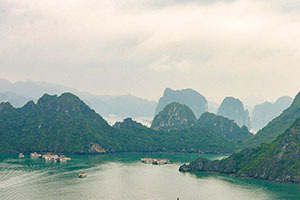 You may like to rise early in the morning to experience Tai Chi class which is admired by beautiful scenery. Once we arrived in Kampong Chhnang, take a local boat and disembark for a guided tour to the village specialties – Khmer style pottery and the making of palm sugar before returning to the boat we explore the floating villages and wetlands of the region. Get on board for lunch as the cruise resumes the journey along Tonle River towards Kampong Tralach. A ritual blessing ceremony will be offered by religious monks for good wishes for our health and prosperity for all. We will stop at the “Green School” which is partly supported by Heritage Line. See all the river life, which is so different than ours – by a local oxcart ride. Back on board, we sail downstream passing the confluence of the Tonle and Mekong Rivers. You may like to rise early in the morning to experience Tai Chi class which is admired by beautiful scenery before the breakfast is served. The ship continues gliding up towards Angkor Ban Village – the untouched community remains beautiful, traditional houses. get back to the board, a ritual blessing ceremony will be offered by religious monks for good wishes for our health and prosperity for all. 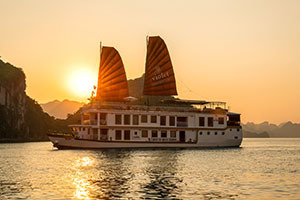 Enjoy lunch as we set sail downstream the Mekong. In the afternoon a high tea is offered and our staff is keen to show you the variety of traditional Khmer fashion. Once we arrived at Island of Koh Oknha Tey, we explore the island by tuk tuk to reveal its famous Cambodian high class silk products as well as learn how silk is processed from its source, provided by little silkworms. Back to our luxury home for relaxation, dinner and overnight. After breakfast, we learn more about the education of the young Cambodian generation (NGO project). The children join us on board, always excited to show their skills in music and art. Afterward, disembark and continue by road to the enhancing Wat Hanchey – one of the Pre-Angkorain temples, built in 7th century, pampered by breathtaking views over the Mekong. Back on board to enjoy lunch, our staff is keen to show you the variety of traditional Khmer fashion in the afternoon, watch the riverbank during the high tea as the cruise continues to its next stop. Once we arrived at Island of Koh Oknha Tey, we explore the island by tuk tuk to reveal its famous Cambodian high class silk products as well as learn how silk is processed from its source, provided by little silkworms. The ship arrives in Phnom Penh Capital. Have your own free time or pop of out the ship to see the evening highlight of Phnom Penh Riverside or you may like to walk around for a chilled cocktail in a colorful bar. You may like to rise early in the morning to experience Tai Chi class before having breakfast. Once we arrived in Kampong Chhnang, take a local boat and disembark for a guided tour to the village specialties – Khmer style pottery and the making of palm sugar before returning to the boat we explore the floating villages and wetlands of the region. 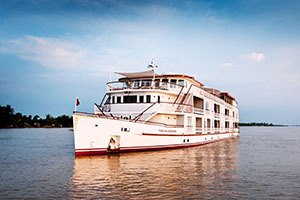 Get on board for lunch as the cruise resumes the journey along Tonle River towards Kampong Tralach. We will stop at the “Green School” which is partly supported by Heritage Line. See all the river life, which is so different than ours – by a local oxcart ride. The ship arrives in Phnom Penh Capital. Have your own free time or pop of out the ship to see the evening highlight of Phnom Penh Riverside or you may like to walk around for a chilled cocktail in a colorful bar. Today we start with a full day guided sightseeing tour to Phnom Penh main tourist attractions including The Killing Field “Cheung Ek” where hundreds of lives were proceeded between 1975 and 1979 under Khmer Rouge. Return to witness tragic Tuol Sleng museum, was a former high school, which was turned to Tortured Prison S-21 later. If you don’t want to visit these sad sites, alternatively, explore the city in the morning on your own before re-joining the group. Have delicious lunch at a selected fine restaurant in the city. Phnom Penh. Take some rest before enjoying BBQ dinner followed by Apsara traditional dance performance. Enjoy your last breakfast aboard your floating home. We will disembark the ship after breakfast and take a waiting car then transfers to your hotel (own arrangement) or airport for your next destination.